Look how handsome I am. that TOTALLY just made my day. Thanks lady! HA!!! Ditto to the first four posts. Not only is he a handsome goose and bovine-wannabe, but he is a HAM BONE! They’ll think I’m nuts @ work today when I start chuckling just thinking of these pics. This post is hilarious. Love it! He’s got the blue steel looking going on! Love it! I’m looking! I’m looking! 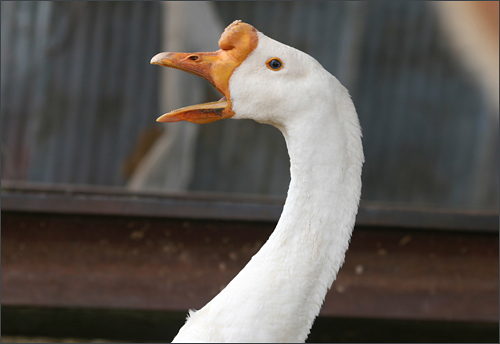 Geesh, Geese can be so demanding! That Ricardo!! What a gorgeous guy….I’m in love. My special wish for today: that I could see the whole farmily in person. Well, off to work. See ya later. Handsome Ricardo! Love your stories and you sharing your life with us all! Thanks Shreve! What a great poser! Good post! Oh Ricardo, how I love thee! 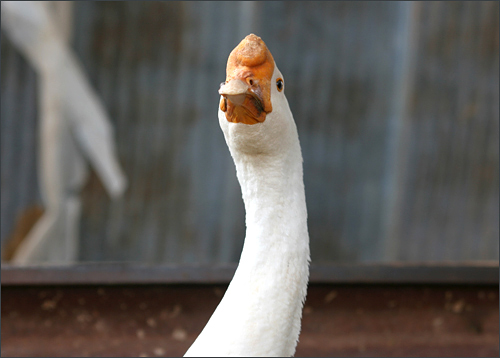 You are the goose to my gander. OMG I am LMAO and LOL’ing!!! Madonna’s Vogue – Strike a Pose song is running through my head right now :D Long live Ricardo! I agree with Colleen G! totally strike a pose. Thanks for sharing, great way to start a Friday! 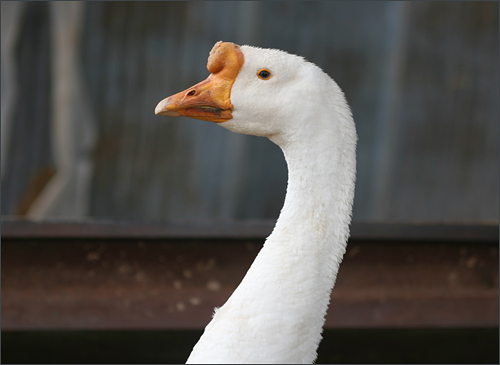 have you ever told the story of how a goose joined the farmily? 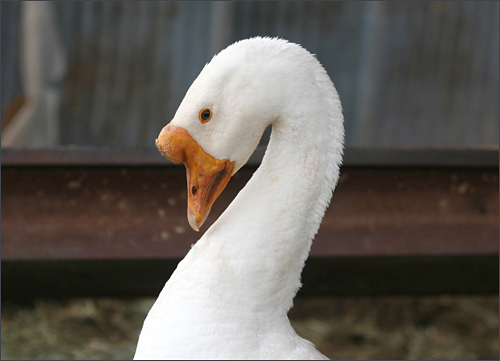 This goose KNOWS he’s handsome – and he’s right! HE IS HANDSOME!!!!!! I LOVE his comments! Sending good wishes from two Ricardo-Fans! How funny – what expressions!! Tell Ricardo, yes, we are looking whenever we get the opportunity! Now, go babysit that beautiful Fiona! I’m looking! I’m looking! How could I not!??! How handsome! We know that Ricardo thinks he is govine, but how does he get along with the rest of the farmily? Great post and I also would like to know how he joined the Farmily. Monsieur Ricardo is a Star. He is the handsomest guy in the West. Look at that neck, those eyes, those lips ! He works so hard as well, keeping all the cows in line, counting them following them and as Daisy gets pregnant every five minutes, it’s a lot of responsibilities…. I am glad you did a tribute to him today , he deserves it. How does he stay so clean and white? Many thanks to you and Ricardo for the close-ups; he really knows how to please his public. I’d honk for that hunk any day! I just have to say that his name is PERFECT for him! This guy is just a trip. 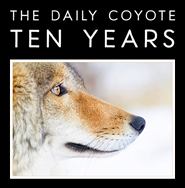 I hope he lives for a hundred years. Oh my gosh I lol’d! Funny post! I totally hear that in Billy Crystal’s “Fernando” voice when I look at these. I love geese. A wonderful Friday laugh! Thanks! He is very handsome and deserves a lady friend. “Hey everyone! Come see how good I look!”. This made my day, totally laughed out loud. What a gorgeous guy! Watch out Aflak Duck! Ricardo will steal any scene!! I love Ricardo. He IS so handsome!! We love this! Ricardo’s so handsome. For a goose he sure is a ham!! Honk if you think I’m handsome. Ricardo….you are handsome!!! I love geese and even chickens. This year, my husband and I finally got our first batch of chickens. I never realized what a personality a chicken has!!! The more critters I get, the more I don’t like eating meat!!! You always make me smile w/ your clever entries! Doesn’t everyone love Ricardo?? Another admirer here! 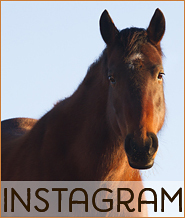 I’m so happy you post your fabulous pictures of each member of the farmily. Ricardo: the perfect name for the perfect goose. It must be fun to have a neck like that. Love it! You just know that’s what he’s thinking too!! Ha ha! What a handsome devil! Love that! Reminds me of how my cat will demand my adoration at times. lol, well that gave me a giggle! Like all birds, Ricardo is convinced he is Ruler of All He Surveys. In this case, he is correct. <3 Ricardo. Perfect name. VERY handsome. Perhaps he was a matador in a former life. 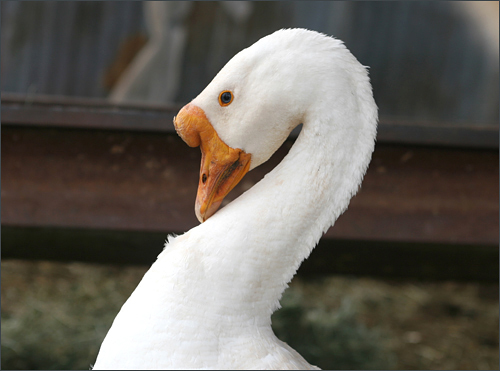 That’s a good-looking gander (not goose, I surmise)– like how he “takes a gander” himself at the camera! LOL. yes! definitely a Ricardo lover here. your captions and photos are PERFECT. RIP Ricardo – broke my heart to read about your death. Oh sweet baby how we loved you. May you have June bugs to feast upon. Love you, Ricardo. Blessings on your journey. You should write a children’s book about Ricardo and his friends. It would be a great story about acceptance.